Kady and Ezra thought their break-up was messy until they witnessed their entire world literally falling apart. Now they're piecing together what's left of their lives, and their romance, and trying to survive an intergalactic war. Amie Kaufman is the award-winning co-author of the STARBOUND series. Jay Kristoff is the award-winning author of the LOTUS WAR series. Collectively, they are 12'5' tall and live in Melbourne, Australia, with two long-suffering spouses, two rescue dogs, and a plentiful supply of caffeine. They met thanks to international taxation law, and stuck together due to a shared love of blowing things up and breaking hearts. You can learn more about Amie and Jay at amiekaufman.com and jaykristoff.com. A gripping novel that keeps you reading! From the beginning you are immersed in a realistic action packed sci-fi world where survival is the aim. The two protagonists (Kady Grant - a clever, witty computer hacker and her ex-boyfriend Ezra Mason - athlete who turns reluctant fighter pilot) live on a mining planet, suddenly attacked by a world dominating corporation who are obliterating populations to destroy opposition. They become reluctant but key figures, beautifully crafted as complex characters, in a chaotic war to save their people. The style of the novel is unique and fascinating - a book that represents a file of emails, interviews, reports, computer screens interspersed with floating messages, countdowns and accounts of events as our two reluctant heroes battle not only physical enemies but the Artificial Intelligence system that controls every aspect of physical life. Far from being fragmented this collection of documents maintains the thread of a compelling story - the relationship between the protagonists and their increasingly desperate battle to save human lives against all odds. The action is constant with e-mails between the characters offering some quieter moments as they work together to overcome constant threats. In the classroom this almost graphic style is appealing, and allows for students to add to the files by creating further emails, reports and interviews at pivotal moments (of which there are many!). There is also scope to create files from the perspectives of other characters. This novel could also link to ethical issues regarding sustainability and the responsibilities of Multinational corporations. Students could also experiment with the format of their responses to echo the styles in the novel. Immensely enjoyable and potentially great for reluctant readers. It’s been a while since I’ve picked up a science fiction book, even though I’m a fan of the genre. Reading this was a great way to get back into it. The story is action packed and full of twists and turns. It was difficult to put down and I am really looking forward to reading the next book in the series. Kady and Ezra are two evacuees amongst thousands, who escaped a vicious attack on their planet. Safe on a fleet of three spaceships, including the battleship, Alexander, they think that they might escape further attack. This of course is not the case. Between the apparently mad AI running the battle ship, a plague that turns ordinary people into killers and the warship chasing them they have little chance of survival. The way they overcome each of these obstacles is ingenious. By using a mixture of interview transcripts, electronic messages, diary entries as well as audio and surveillance tape transcripts, the authors kept the story line moving at a fast pace in a communications manner many teenagers are familiar with. Clever text placement also creates a feeling of action in place of illustrations. This is a good method of showing students that there are other writing styles beyond the normal narrative, they could use this as a basis for experimenting with their own story telling. One of the key ideas is that those in command don’t always make the right decisions, quite often they had to make tough calls in extraordinary situations. Each of these decisions contribute to the unfolding disaster, but what alternatives were there? This idea would lend itself to students trying to work better options. They could also look at the decisions Kady and Ezra made, were these the right decisions and did they help or hinder the evacuees? As the genre of this novel was science fiction/ action/verging on thriller and part romance, I thought I would struggle to wade through all 599 pages. I had pre-decided that surely we didn’t need another futuristic novel that involved space and warships. However needing to keep up with what students are reading, I thought maybe I should take a look. By the end of page one I was actually quite interested and wow – there was even a quote at the bottom of page one by George Orwell. As the novel progressed, consecutive nights were spent reading to the irresponsible early hours of the morning not wanting to put the novel down. In a nutshell, Illuminae is set in 2575, a war exists over a planet and rival spaceships are fighting to the death. However while this battle takes place, there is also an outbreak of a plague, computer hacking, and a relationship between Kady and Ezra, two of the main characters. There is a very clever twist in the narrative, and the main computer system aboard one of the ships pretends to be one of the main characters. The main ‘voice’ in this narrative is Kady’s, she is computer savy, witty and personable, great attributes to entice a female readership to this novel and genre. Teenagers will love this book, it’s such a reflection of their lifestyles – there’s no narrative that we formally expect in a novel, it’s just a series of emails, documents, descriptions of surveillance footage, transmissions, graphics, etc. (It almost replicates teenagers friendships; no real conversations – just technology, SMS, Facebook, Twitter, etc.) The language is contextually relevant for teenagers, swearing has been blacked over but teenagers can still decipher what is being said. I’d definitely recommend a couple of copies for every library – this book will be in demand. For classroom use Year 10 or Year 11 English, it lends itself to studies of sci-fi, relationships, author studies, other worlds and their existence, etc. I should warn you – this is the first book in a trilogy – if you read this one, you’ll want to read the next two. 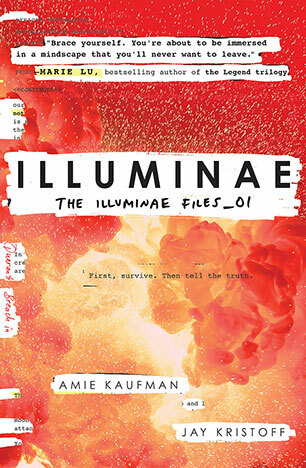 Illuminae (The Illuminae Files_01) tells the story of Kady and Ezra who are forced to evacuate their planet and find themselves knee-deep in an all-out space war, complete with fighter jets, hackers, a crazy Zombie virus and an A.I. system that doesn’t seem to know which side it’s on. Although Kady and Ezra are allocated different vessels out in space, they are both on an interstellar mission discover the truth: to find who is really responsible for the attack and the virus that seems to be quickly making its way through what’s left of the civilian population. So you might be thinking that you have heard Kady and Ezra’s story before, but the great thing about Illuminae is that the story itself, co-written by Amie Kaufman and Jay Kristoff, has taken on an exciting format that I believe will motivate kids who don’t usually read books. I love the variety of texts types used, which includes interviews, descriptions of security footage and instant messages, as well as the visuals of spaceship blue prints, vapour trails and more. Although it does take a while for your mind to get used to the unusual narrative format, once you do, you’re hooked! Illuminae is hard to place into a particular genre. It’s a unique mix of science-techno-fiction, action-zombie-apocalypse and a bit of romance. The story explores ideas such as relationships, survival, identity and why countless versions of the truth can and do exist. I would recommend this to any students in Years 9 and up. Despite the 600+ pages, kids will be drawn in by the very pretty cover and then will get to piece together the Illuminae story bit by bit. As an English teacher, I will definitely be using parts of the book in my classroom, especially when teaching science fiction. If sliced bread was a novel, then Illuminae would be the best piece of bread ever baked. Not just your average YA epic science fiction novel, Illuminae blends Gen Z text speak with military censorship to create characters so real their voices become as close your best friend. Amie Kaufman and Jay Kristoff are the Melbourne authorial team-up that have crafted a real page-turner. There is an immediate urgency to the narrative drama and conflict that comes from the media res nature of the opening and without unnecessary hard sci-fi backstory. The reader doesn't have to be experienced with science fiction conventions or concepts to understand typical relationship breakups and high school problems, so young teen readers will love the opening and want more. As the first in a planned trilogy, I'm hopeful the tension and excitement of my reading experience continues. The inventive stylistic choice to break up the story through message streams, interviews, military documents, and camera footage archives lends a strange mixture of formality and casual chatting that realistically portrays the characters despite their unusual intergalactic refugee status. I couldn't help but feel that Kady and Ezra are the most real YA characters I've read in this type of fiction in years. The potential for this novel in class lies on par with much popular fiction as The Hunger Games and Divergent, and I'm sure this will be a hit so get on to this before the band-wagoners decry your lateness to this amazing novel. There is a planned movie from Brad Pitt’s production company, so interest will be heightened in coming years. This is my own subjective projected popularity on the book though, and not an attempt to lump it in with perhaps the less-literary views some may have of novels in that vein. Illuminae presents a tale with parallels to Marchetta’s Looking for Alibrandi, simply featuring space ships, a deadly contagion and manipulative artificial intelligence. There is also an opportunity for diverse creative writing to be explored through a variety of methods. Themes and concepts such as power, corruption, humanity (through a damaged and interesting AI called Aidan), sacrifice and more are explored, teased and bloom. I highly recommend Illuminae any library shelf and high schoolers bag. It also makes fantastic escapist reading for one of those weekends when you need a nice drink (warm or cold) and a good book. This complex, detailed and fascinating novel tells the story of Kady and Ezra, two teenagers in the year 2575 who live on Kerenza, an isolated mining planet in a remote part of the galaxy. They are trying to deal with their bitter relationship breakup when mega-corporations go to war over the colony and there is a devastating attack on those who live there. Most people they know are killed in the attack, but Kady and Ezra are evacuated with a small group of other survivors. Placed on separate ships, they become part of a small fleet fleeing the warship Lincoln and trying to make it to the nearest space station. With few resources and increasing problems, computer genius Kady contacts Ezra in order to work together to establish what exactly is happening within the fleet and to try to survive the increasing odds against them. The plot of the story emerges for the reader not through a traditional narrative, but by reading through the different elements of a dossier of records and observations of Katy and Ezra’s actions and behaviour during their months in space. The dossier includes the transcripts of interviews and video footage, emails, IM conversations, Artificial Intelligence logs, lists, ships plans and visual representations of different situations. Multiple perspectives are offered, and multiple voices contribute to building the overall picture of what actually happened to Kady, Ezra and the others who fled Kerenza. The range of perspectives from the different reports, interviews and files slowly build a picture of their desperate struggle to survive: being hunted by a superior warship, problems with supplies, difficulties with communication, concern over the behaviour of the Artificial Intelligence managing the fleet, and a terrible virus that threatens all the remaining survivors. The different styles of the documents which make up the dossier and the narrative, and the fact that the information is provided from multiple perspectives, means there is a great deal of scope to use this text in the classroom. The effect of form on the reader and the conventions of different forms, as well as the choice and effect of different writing styles are key elements in English in the senior years. The text could be used as the basis of discussion of narrative due to its unconventional and innovative structure, as well as the conventions and impact of different writing styles. The stylistic elements of the more formal reports, for example, could be contrasted with the freer styles of the IM messages or personal logs. How the type of language and the stylistic elements selected by the author give specific impressions and convey meaning beyond the literal words is an important element of any text. In addition to the study opportunities provided by the novel’s atypical narrative form, Illuminae also includes elements of a range of genres which could be explored. It incorporates elements of drama, romance, survival and horror, and a close look at specific sections could let students examine how each plays a part within the storyline. The creation of suspense is another aspect of the text which could be studied, with many sections effectively building tension, in regards to the action at hand as well as why the entire dossier was compiled in the first place. This novel was an engrossing read. It was difficult to anticipate the twists of the narrative, and you needed to become immersed in the text to put together all of the pieces of what occurred. As such, I would recommend this text for strong readers from Year 7 upwards. In terms of appeal and also for study, it would be most broadly suited to students of Year 10 level.